On 1 August the 20 Russell Group universities was enlarged from 20 to 24, following the incorporation of Durham and Exeter University, Queen Mary, University of London and the University of York. As described on the Russell Group University Web site “[the] universities are to be found in all four nations and in every major city of the UK. They operate globally, attracting international students and academic staff from many different countries, but also have a strong role and influence within their regional and local community.” But how effective are they in using popular social media services to attract potential students, engage with existing students and staff and with the wider community? In order to provide a benchmark of use of the most popular social networking service a survey of the number of likes for the official institutional Facebook presence has been carried out. In order to gather evidence of use of Facebook in the higher education sector a survey of Facebook usage, determined by links for institutional pages, have been carried out for the Russell Group universities. This survey follows on from previous surveys carried out in January and September 2011 and May 2012 for the 20 Russell group universities which enabled trends to be detected which can inform discussions and policy decisions on institutional use of Facebook. Note that the data provided in the following table is also available as a Google Spreadsheet. On 10 August 2012 it was brought to my attention that the official Facebook page for the University of Exeter was not being analysed. The table was updated with the correct Facebook entry. Following publication of this post information was received on changes for the official Facebook page for the University of Liverpool. The table has been updated using the new Facebook page. The data for the surveys was collected on 11 January 2011, 25 September 2011 (estimate), 16 May 2012 and 2 August 2012. The URL of the Facebook pages for LSE (from http://www.facebook.com/pages/LSE/6127898346 to http://www.facebook.com/lseps) and Queen’s University Belfast (from http://www.facebook.com/pages/Queens-University-Belfast/108518389172588 to http://www.facebook.com/QueensUniversityBelfast) have changed since the last survey. The URL change for LSE appears to be transparent. However the change for Queen’s University Belfast appears to be the result of a merger with another page: “You were automatically redirected from Queen’s University Belfast to this Page because we detected it as a duplicate. If we’re wrong, please let us know so that we can improve our results.” This merger initially appeared to have resulted in a loss of likes from the previous survey, but this no longer appears to be the case. 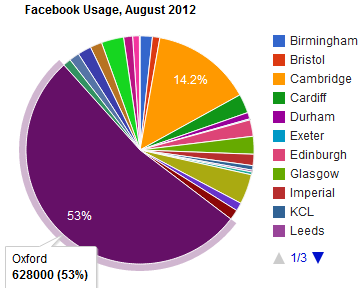 There are now over a million ‘likes’ for the institutional presence on Facebook of the 24 Russell Group universities. A post on this blog previously described a significant increase over a period of eight months in the number of ‘likes’ for the twenty UK Russell Group Universities, which totalled about 999K in May. The current increase over a period of about ten weeks is primarily due to the additional numbers provided by the four new Russell group universities, which come to a total of over 37K likes. It should be noted that, as illustrated 67% of the likes are provided by just two institutions: the Facebook pages for the University of Oxford (with 628K likes) and the University of Cambridge (168K likes). Note that a Google Spreadsheet of these figures, together with the accompanying charts, is available. In some circles providing evidence of Facebook usage is an activity which people feel should be avoided, since Facebook is a ‘walled garden’ and has a blatant disregard for individual’s privacy. In the higher education sector I would argue that we have a need for policy decisions to be informed by evidence. There is therefore a need to gather evidence of use of such services in order to inform decisions on their use and also to learn from their strengths and weaknesses and their popularity, so that such lessons can be used in order to make more effective use of existing services and also to be prepared to use new social media service which could replace or complement today’s popular services. Anyone who would like to see Facebook replaced by Diaspora, say (described in Wikipedia as “a nonprofit, user-owned, distributed social network that is based upon the free Diaspora software … is not owned by any one person or entity, keeping it safe from corporate take-overs, advertising, and other threats“) would surely benefit from gaining an understanding of Facebook’s popularity. From looking at the names of institutional Facebook accounts and the corresponding URLs and the popularity of the accounts it would appear beneficial to have an easily remembered name, to avoid fragmentation of official accounts and to avoid the need to rename an accounts address. This might suggest that it would be useful for institutions to claim a meaningful name on social networks which may gain in popularity in the future. As suggested in a post on Institutional Use of Social Media in China this has been an approach which has been adopted by 19 of the first 20 institutions with an official presence on China’s Sina Wēibó social media service. But at a time in which it is increasingly important to be able to justify the return on investment in using new services, it will be important to document the intended purposes of such new services and the benefits which may be gained. Back in May 2007 in a post entitled Something IS Going On With Facebook! I commented on early signals of growth in interest in Facebook following the launch of the Facebook Platform. A few months later, in November 2007 a post entitled UK Universities On Facebook reported that “a Facebook search for organisations containing the word ‘university’ revealed ) a total of 76 hits which included, in alphabetical order, the following UK Universities: Aston, Cardiff, Kent and the University of Central Lancashire (UCLan)” – and it is interesting to note that the links to the Facebook pages for these early adopters still work even though the URLs have changed. so, for those unis who have a “page” (with new revised Ts&Cs) on facebook…what are your strategic objectives? key performance indicators? external target audience, or a mix of internal and external? Looking back it would be interesting to see if an institutional Facebook presence has supported strategic objectives. Would the 24 Russell Group Universities have regarded having a total of over a million as providing a proxy measure of some objective? On the other hand, might this be regarded as a failure? We have five years of experience of institutional use of Facebook, which includes a number of snapshots of quantitative evidence. It will be interesting to see how this evidence of the recent past can shape and inform discussions and decisions on use of social media over the next five years. Interesting to see these stats, but to gauge how successful universities are with Facebook you really need to look at other metrics around engagement, reach, influence, etc. You can have plenty of likes but very little engagement and measuring likes is very much like judging a web page’s success based on simple page view numbers – a very raw measure that doesn’t tell you an awful lot. I would agree with these comments, although I should add that since such information is restricted to Facebook page administrators it is not possible to get a picture across a community. However a follow-up post which provided a Survey of Institutional Use of Facebook was also published in May which contained information about a survey in which Tom and I invited those involved in using Facebook to support institutional activities to provide details of their work. In order to gain a broad picture of Facebook use across the sector this survey is still open. Please note that University of Liverpool’s official Facebook page is found at http://www.facebook.com/livuni and not the address featured in your report. Please contact us to clarify.